Pumpkins are really the only autumn decoration around my house (besides my fall dish towels) because I hate storing seasonal things. Don't get me wrong. I love going into a home beautifully decorated in fall colors, but at this stage of my life I just don't have the time or the storage to redecorate four times a year. We got a pie pumpkin at an orchard early in October and then were gifted two more at a fall party. And I killed them all today. Sorry, vegetarians. 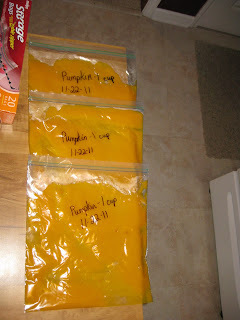 If you've never made your own pumpkin puree, there is no reason for me to tell you how. The Pioneer Woman did an amazing job of giving photo-illustrated instructions. There's just one significant difference in my house... I'm not allowed to do anything alone. I mean it. All you moms know what I'm talking about. Even that 10-minute shower is interrupted by questions about why Grandma is sick and when she's getting better and when she'll visit. You know, sometimes I feel like I'm playing second-fiddle to my mom. Oh well. I think she's amazing too. I understand my son's obsession. Back to the pumpkin! "Can I help you?" is one of the most frequently heard questions around here. So up on a chair he went. For those of you who are horrified that I allowed my 3 year old near a food processor, have no fear. 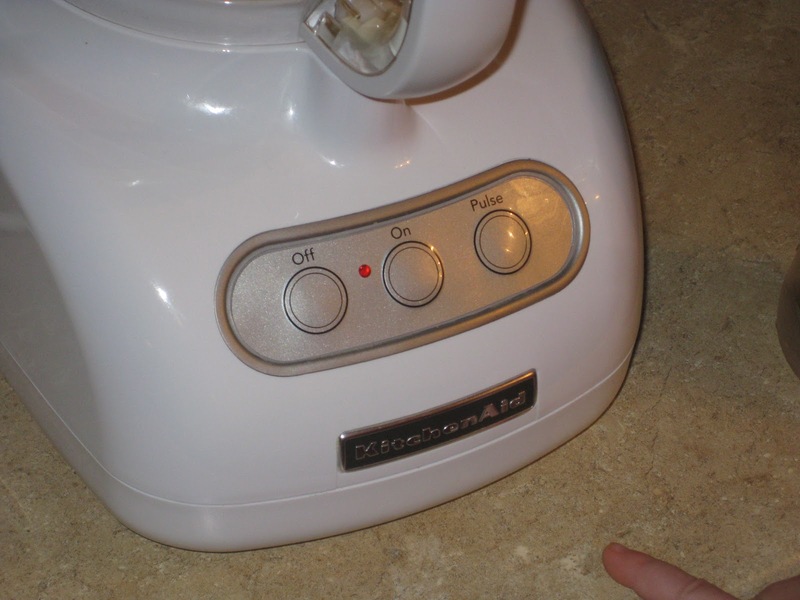 There is a safety feature which does not allow it to turn on unless the lid is latched in place. 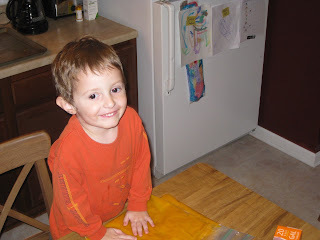 Plus, I'd rather he learned about appliance safety when I'm around rather than when he decides to try being the Iron Chef when he's 9. I know that day is coming. His helping quickly became a reading lesson. 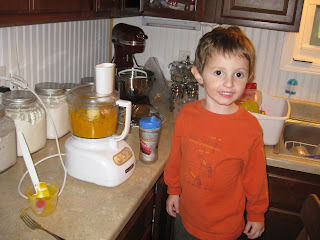 He sounded out "on" and "off" and was rewarded by being able to use his knowledge to puree the pumpkin all by himself. Yep. I didn't do anything. Just ask him. 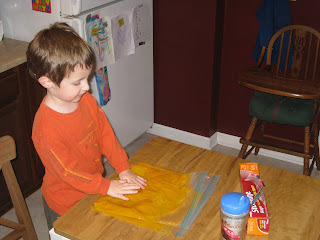 Then everyone's favorite part: putting the puree in plastic bags one cup at a time (which meant we had to have a long conversation about why we have a measurement system) and squishing it flat. It feels awesome! I didn't want to freeze these bags. I wanted to keep them out to play with. I almost didn't let him help. That would have been a crime. He then helped me sound out the word "pumpkin" cause ya know Mommy needs some spelling help. Then we had a conversation about dates and calendars as we marked each bag. And as I was doing all these things with my firstborn, I had the awesome realization that life really is a classroom. Caleb had a blast and told everyone who came in our door that we were having pumpkin for dinner (which we weren't), but he was also introduced to basic measurement, reading, spelling, and safety principles. Even more than just learning a few life skills, it made me happy that in a world of waste we were using what had been given to us. In this world of hunger, we saved a few dollars (better spent elsewhere) on pumpkin by using our decorations to make 7 cups of pumpkin puree. I feel like Maria Von Trapp. I'm going to go make curtains from my kids' clothes. Just kidding. But seriously, I think this is the beginning of looking for ways to re-purpose what we already have to meet our needs so that we can use our resources to meet the needs of others. Make sense? I hope so. And if you don't want your leftover pie pumpkins (the small ones), bring 'em over here! 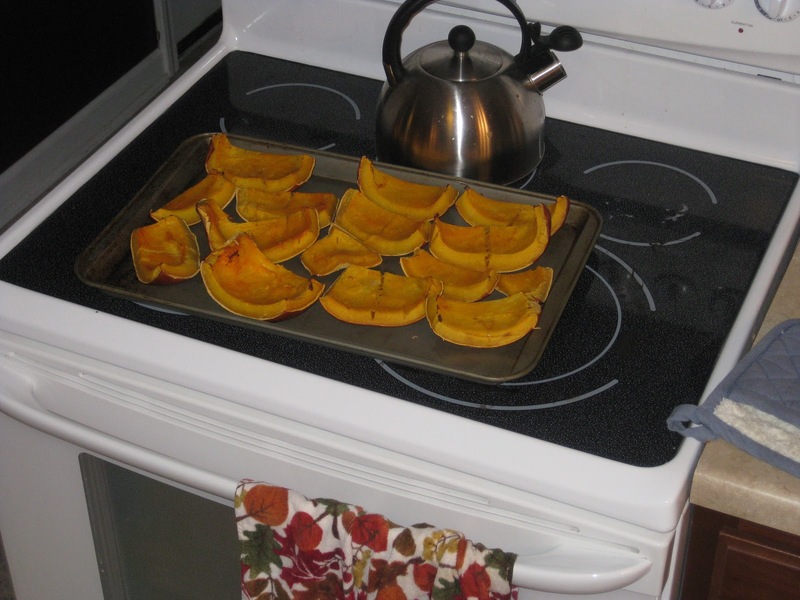 If we're really friends, you know I can never get enough pumpkin. I was so going to do this until I read the directions. I only have huge pumpkins...hmmmm. Can you hear me now? Uh-oh. Life is not an emergency. What Do I Do with All These Prayer Cards?